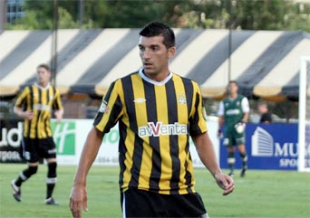 Glenside native and former Temple Owl Tony Donatelli put the “batter” in Charleston Battery this weekend when he led the South Carolina team in a 4-0 thrashing of the Rochester Rhinos on Saturday. In the playoff berth-clenching win, Donatelli was involved in three of Charleston’s goals, scoring in the 18th and 30th minutes, and providing an assist in the 86th. While the game may have been a season high for the local lad, one which earned him USL PRO Player of the Week honors, Donatelli’s performance this weekend is but one in a series of successes in the lower rungs of the American soccer pyramid. After spending four years playing in college at Temple and two successful seasons with the Ocean City Barons (now Nor’easters) in which he made 34 appearances and scored 14 goals, Donatelli was picked in the third round of the 2006 MLS Supplemental Draft by the Houston Dynamo. Though he was not ultimately offered a contract by the team, Donatelli graduated to the professional ranks that year as a member of the USL Vancouver Whitecaps and was part of the 2006 USL First Division Championship winning team. Concurrently, Donatelli also made a name for himself with the indoor Philadelphia KiXX, with whom he scored 37 goals in 59 appearances. After three years, Donatelli was traded by Vancouver to cross Canada-rival Montreal Impact where he played two seasons and helped the team win the 2009 championship against his former club. In January 2011, Donatelli was given a second chance at MLS when he signed with the San Jose Earthquakes, but he was again dropped prior to the start of the MLS season. He then moved back to the USL, this time with the Rochester Rhinos where he made 11 appearances and scored 2 goals. Donatelli joined Charleston earlier this year and has regularly featured with the team since then. In 18 appearances, he has put up 3 goals and 3 assists as he looks to add another USL Championship to his resume. Bobby Convey, M, Kansas City — Did not play. Tournament: 0 games. Jeff Parke, D, Seattle — In the 18, but did not play. Tournament: 2 games, 2 starts. Mike Seamon, M, Seattle – Did not play. Tournament: 0 games. Antoine Hoppenot, M/F, Philadelphia — Played 45 minutes in Saturday’s 3-1 loss to Chicago. Season: 12 games, 1 start, 2 goals for Philadelphia. 4 games, 1 goal for Harrisburg. Zach Pfeffer, M, Philadelphia — In the 18, but did not play. Season: 0 games. Andrew Wenger, F, Montreal — Played 14 minutes in Saturday’s 1-0 win over New England. Season: 15 games, 4 starts, 4 goals. Zarek Valentin, D, Montreal — Did not play due to left ankle strain. Season: 14 games, 14 starts, 1 goal. Jeff Parke, D, Seattle — Started and played 90 minutes in Sunday’s 2-0 loss to San Jose. Season: 20 games, 19 starts. Bobby Convey, M, Kansas City — Did not play due to right hamstring strain. Season: 15 games, 14 starts, 1 goal, 2 assists. Jeff Larentowicz, M, Colorado — Started and played 90 minutes in Saturday’s 3- 2 loss to Dallas, scoring a goal in the 55th minute. Season: 22 games, 22 starts, 3 goals. Bobby Warshaw, D, Dallas – Did not play. Season: 6 games, 2 starts. Bill Gaudette, GK, New York — Started and played 90 minutes in Friday’s 2-0 win over Houston, recording three saves and allowing zero goals. Season: 6 games, 6 starts, 14 saves, 7 goals allowed, and 3 clean sheets for New York. 3 games, 3 starts, 7 saves, 4 goals allowed for Los Angeles. Corey Hertzog, F, Wilmington — Bye week. Season: 0 games for New York. 15 games, 14 starts, 8 goals, 5 assists for Wilmington. Jimmy McLaughlin, M, Harrisburg — On loan from Philadelphia, played 15 minutes in Wednesday’s 3-0 win over Charleston. Season: 0 games for Philadelphia, 5 games, 2 starts, 1 goal for Harrisburg. J.T. Noone, M, Harrisburg – Started and played 90 minutes in Saturday’s 2-1 loss to Richmond. Started and played 90 minutes in Wednesday’s 3-0 win over Charleston. Season: 20 games, 20 starts, 2 goals, 3 assists. Tom Brandt, D, Harrisburg – Started and played 90 minutes in Saturday’s 2-1 loss to Richmond. Played 45 minutes in Wednesday’s 3-0 win over Charleston. Season: 15 games, 13 starts. Morgan Langley, M, Harrisburg – Did not play. Season: 19 games, 15 starts, 3 goals, 2 assists. Tony Donatelli, M, Charleston – Started and played 90 minutes in Saturday’s 4-0 win over Rochester, scoring goals in the 18th and 30th minutes, and providing an assist in the 86th. Started and played 67 minutes in Wednesday’s 3-0 loss to Harrisburg. Season: 18 games, 15 starts, 3 goals, 3 assists. Ryan Richter, M, Charleston – Started and played 87 minutes in Saturday’s 4-0 win over Rochester, providing an assist in the 18thminute. Played 67 minutes in Wednesday’s 3-0 loss to Harrisburg. Season: 22 games, 13 starts, 2 goals, 4 assists. Drew Cost, M, Rochester – Started and played 60 minutes in Saturday’s 4-0 loss to Charleston. Season: 15 games, 2 starts, 1 assist. Jason Yeisley, D, Richmond – Played 1 minute in Saturday’s 2-1 win over Harrisburg. Season: 16 games, 14 starts, 1 goal. Ryan Heins, M, Richmond – Started and played 90 minutes in Saturday’s 2-1 win over Harrisburg. Season: 20 games, 18 starts, 2 goals, 2 assists.